Our herbal bath and foot products are made with organically grown herbs, flowers, and botanicals, and 100% pure essential oils. No perfumes, dyes, artificial colors, or ingredients are added. Also filled with organic flax, and herbal blends to relax and soothe tired eyes, relieve tension. May be used warm or cold. Tension tamer, headache blend, and eucalyptus. Each muslin bag is filled with ½ oz Lavender flowers. Just toss in dryer with towels or sheets. 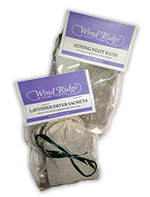 Lightly scented with lavender, cinnamon, cedar, and other natural botanicals to keep moths and other pests away. Hang in closets, in drawers, chests, and even outside to keep insects away. 3x5 Muslin bag. Add tea bag to foot bath, or pan of warm water, let steep 5-10 min. Soak feet until cools. Add tea bag to foot bath or pan of warm water, let steep 5-10 minutes, soak aching, tired feet until water cools. Ingredients include peppermint, rosemary, sage, calendula. Aching Joint Foot Soak Great for achy, tired joints and feet. Ingredients include agrimony, chamomile, sage. All Salves are $10.00 each. Use this salve in place of Benadryl or Cortisone for any inflammation of the skin. Especially effective on bites, stings, rashes, burns, eczema, hives and works well to relieve the itch of poion ivy, poison oak, chicken pox, bug bites. Helps with chapped, chafed skin. Wonderfully soothing salve for promoting sleep, assisting with anxiety, apply to insect bites, lemon balm is known to be effective against herpes virus-used to treat cold sores, shingles, assists with headaches due to tension. This soothing salve contains all the ingredients needed to treat muscle strains, sprains, bruising, and mild joint discomfort. Rub into the affected area as needed. Use in any soft tissue injury such as strains, sprains, aches, apply immediately to bruises to decrease discoloration, swelling and size of bruise. Useful for menstrual cramps, helps relieve tension/pain in neck due to stress, good for low back pain, traumatic injury. Very effective salve for cuts, wounds, rashes, itching, bites, stings, sunburns, bruises, and promotes healing of wounds, soothes pain of injuries and irritations.. Do not use on deep, infected wounds due to rapid healing.